The Temprakon-Advance down pillow is the ideal pillow for all those of you who like to enjoy the comfort and touch of the highest quality down. It is a down pillow with body, softly supporting, and so huggable! 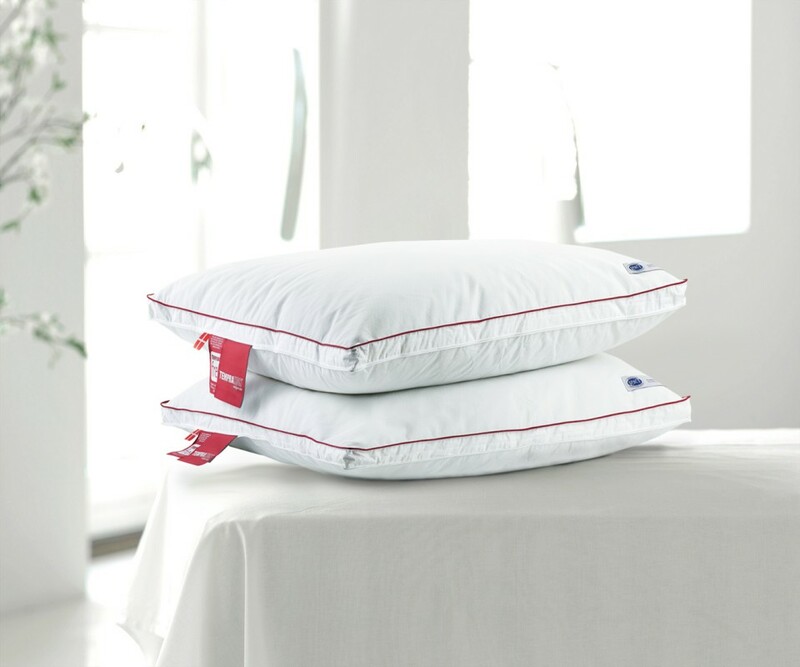 Besides the luxury and comfort offered to you by the excellent down filling, this high quality down pillow is carefully designed to carry out a dual function: It both regulates temperature, and eliminates excess moisture. It will help you sleep without perspiration and at the temperature which your body requires. Try out this wonderful pillow just one night and you won’t want to go back to using any other! Thanks to the extra special care taken in manufacture and in the care taken in the selection of natural materials, it is a hypo-allergenic pillow and suitable for those people who suffer from sensitive skin, allergies or asthma -associated illnesses. We are really proud to have found for you the ideal pillow. Combine its gentle support with the softness of the highest quality down - ‘Premium Class-1’. Finally you will be able to feel the amazing sensation of being able to fall soundly asleep on a cloud of the softest down which caresses and supports both your head and neck. 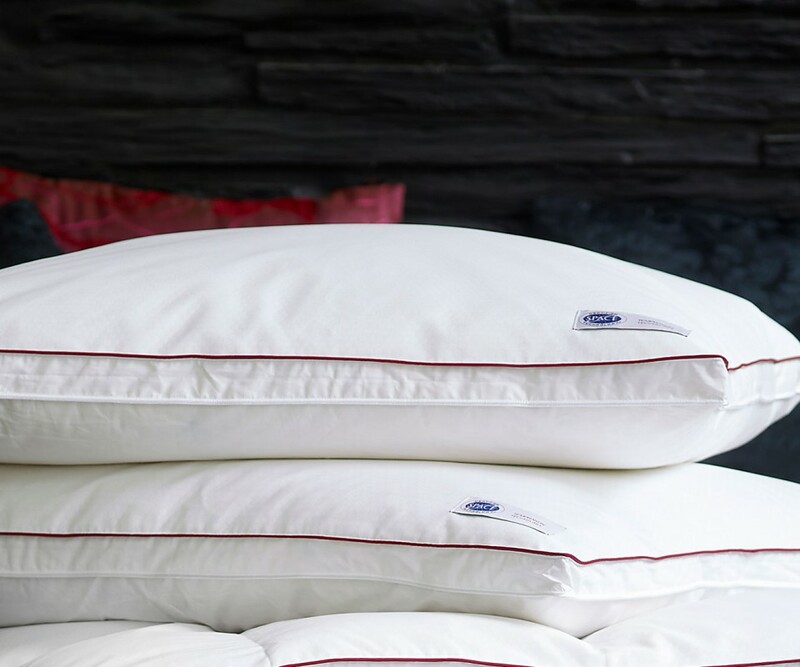 The superb down filling used in this fabulous pillow has been given, by the European Down-Feather association (EDFA), a “Premium Class-1” certification – the highest quality certifications offered in the world of down filling. Our manufacturers have also selected their European suppliers with the utmost care so to obtain for you this excellent quality down filling. 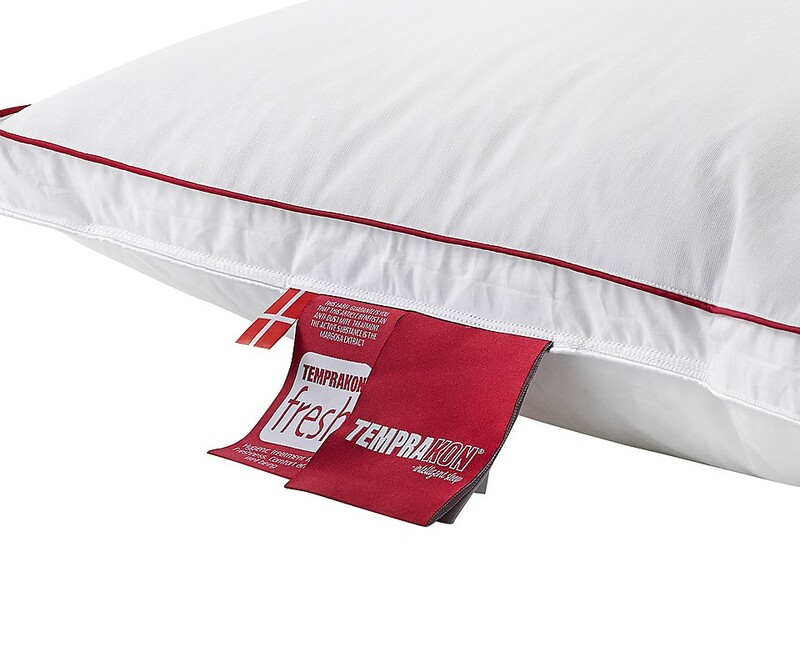 This Temprakon-Advance down pillow is a pillow with sufficient body to offer you a soft and foamy support as you sleep. In order to be able to offer you this high degree of support we have combined our down ‘ Premium Class-1’ with the exact amount of tiny feathers chosen specially for their size. It is due to this careful combination of high quality down and tiny feathers (60%-40%) that we have obtained for our clients a soft and huggable pillow with body. You are able to enjoy the softest sensation of down, and at the same time benefit from the perfect support for your head and neck. This pillow is ideal for those of you who enjoy sleeping on your back, on your stomach or on your side. A pillow with an ‘intelligent’ heart of down. The Temprakon-Advance down pillow also holds for you a big surprise! This is an ‘intelligent’ fabric with great thermo-regulating capacity. 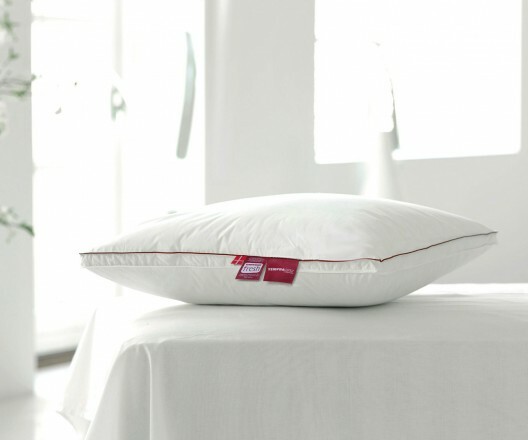 This special fabric is capable of storing any excess heat in the interior of the down pillow. It is only if your body temperature drops and you need extra heat, that this warmth is liberated little by little enabling you to enjoy a perfect night’s rest. 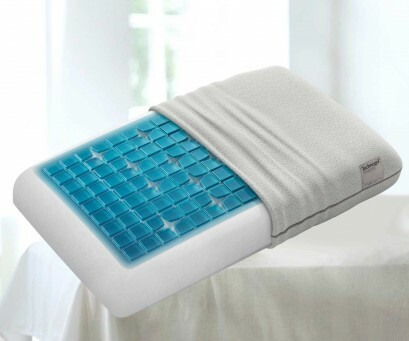 Besides, and at the same time, the pillow eliminates surplus moisture, and you will sleep soundly and happily all through the night without cold or too much heat and without sweating. Enjoy the special smoothness and freshness of the outside cover of the pillow. The exterior fabric of the down pillow Temprakon is of 100% cotton Super Cambric, which is amazingly soft and pleasing to the touch. At the same time the close weave of the fabric used in our production process avoids any loss at all of down from the inside of this super-cozy pillow. 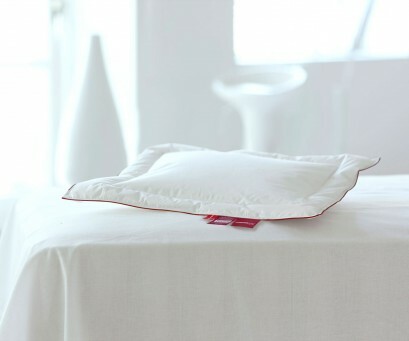 The outside cover of the pillow offers a sensation of natural freshness, which adds yet more comfort for you. 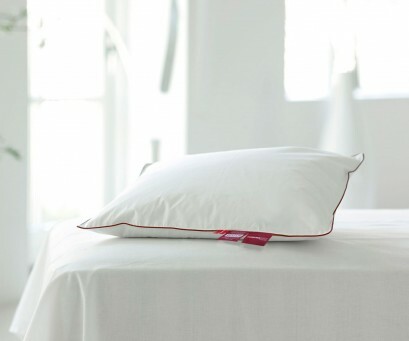 Thanks to a special treatment of natural vegetable oils, this pillow will be entirely bed-bug and bacteria free throughout its long life, remaining as fresh and soft as it was the day you bought it. And if all this is not enough to guarantee for you the perfect pillow, rigorous measures of cleanliness and sterilization in the preparation of the down filling all go to make the pillow totally hypo-allergenic and perfect for your skin and for that of all the family. The pillow is highly recommended for those with allergies or who suffer from sensitive skin, asthma or breathing related illnesses. Why do we like this pillow so much? It is because every detail of the Temprakon-Advance down pillow has been painstakingly thought out so that we can bring to you a very high degree of comfort. It is an immensely adaptable pillow, soft and springy, whilst at the same time offering you support and comfort. You will be unable to find another pillow on the market with such complementary features. We have done our best for you! 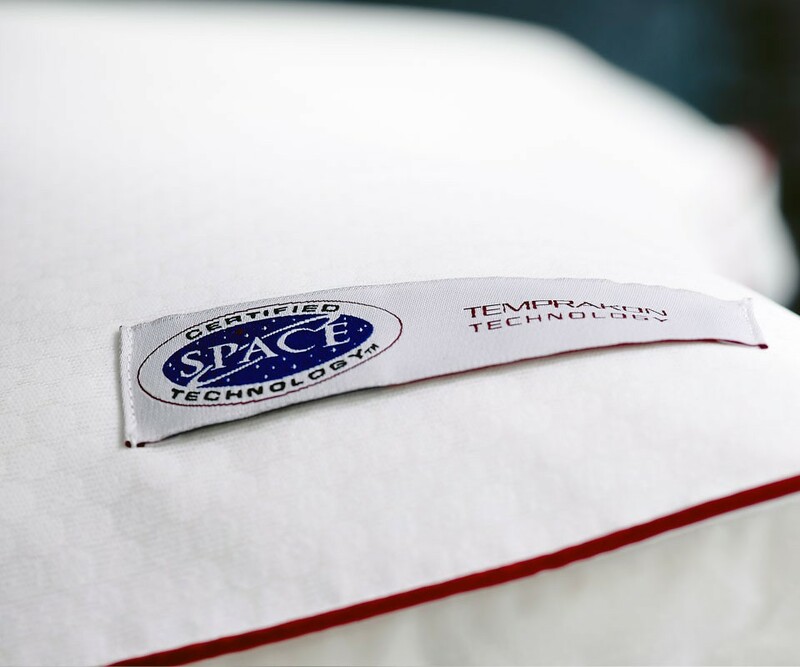 To prove this, the unique Temprakon-Advance pillow is backed by the best quality certificates: Oeko-Tex, Astma&AllergiDanmarkcertified, Nomite, DOWNAFRESH/DAUNASAN, European Down and Feather Association, and Certified Space Technology. The pillow is hypo-allergenic and mite-free. The pillow comes with a 2-year manufacturers’ guarantee and a free one-week trial period. A 100% satisfaction-guaranteed purchase! Smooth and soft. Can’t stop hugging it – it’s so soft and smooth! My partner says I hug it more than him! I really recommend it. A fantastic soft and cuddly pillow. Though it’s made of down it doesn’t make you hot at all! Thanks a lot. Thanks to you, we now have great pillows for all of us. Soft and huggable! Made of down but we never feel too hot. For young people. Just right for our teenage boys. A bit too soft for me but they think they are great! My 17-year-old kept on at me until I bought him one and now he says it’s really cool! This down pillow is a bit too soft for me. Thanks for letting me change it for the Temprakon Air-pillow. You were very understanding. We gave two pillows to my sister and her husband for Christmas. What a successful present! They are very happy and say they have bought more the same. They are amazed how the pillow adapts to different temperatures and needs. A really good buy! Delivery on time too. A really good and useful present.